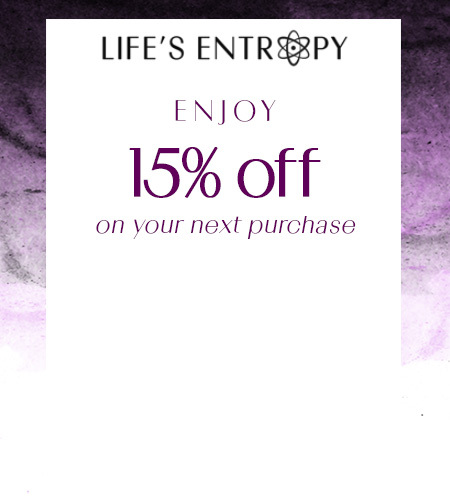 Thank you for shopping at Life’s Entropy. We hope you love our products but if you’re not completely satisfied with your purchase, we’re here to help. Please understand that although we represent our products as accurately as possible, the actual colors you see will depend on your monitor. If you are not completely satisfied with your purchase for any reason, please send us the product back within 14 days of receiving your package. Contact us at contact@lifesentropy.com to process a return. All returns are credited in the original form of payment. Please allow 3-5 business days from when we receive your package for the refund to be processed. Original and return shipping charges are non-refundable. Unfortunately, we does not offer exchanges at this time. If you received a FREE gift with purchase, you must include it with your return shipment in order to be eligible for a full refund. Feel free to hold onto – and enjoy – your complimentary samples. Please email contact@lifesentropy.com, Monday through Friday, 8:00 PM to 5:00 PM Eastern Standard Time, excluding holidays to schedule a replacement. Only products purchased on LifesEntropy.com may be returned for a refund. Unfortunately, we do not accept merchandise purchased at a third party retailer or distributor. Please contact the retailer you purchased your products from and inquire about their return policy. If you have any questions on how to return your item to us, please contact us at contact@lifesentropy.com.